Nearly all economists from across the political spectrum agree: free trade is good. Yet free trade agreements are not always the same thing as free trade. Whether we’re talking about the Trans-Pacific Partnership or the European Union’s Digital Single Market (DSM) initiative, the question is always whether the agreement in question is reducing barriers to trade, or actually enacting barriers to trade into law. It’s becoming more and more clear that there should be real concerns about the direction the EU is heading with its DSM. As the EU moves forward with the 16 different action proposals that make up this ambitious strategy, we should all pay special attention to the actual rules that come out of it, such as the recent Data Protection Regulation. Are EU regulators simply trying to hogtie innovators in the the wild, wild, west, as some have suggested? Let’s break it down. Here are The Good, The Bad, and the Ugly. The Data Protection Regulation, as proposed by the Ministers of Justice Council and to be taken up in trilogue negotiations with the Parliament and Council this month, will set up a single set of rules for companies to follow throughout the EU. Rather than having to deal with the disparate rules of 28 different countries, companies will have to follow only the EU-wide Data Protection Regulation. It’s hard to determine whether the EU is right about its lofty estimate of this benefit (€2.3 billion a year), but no doubt it’s positive. This is what free trade is about: making commerce “regular” by reducing barriers to trade between states and nations. Additionally, the Data Protection Regulation would create a “one-stop shop” for consumers and businesses alike. Regardless of where companies are located or process personal information, consumers would be able to go to their own national authority, in their own language, to help them. Similarly, companies would need to deal with only one supervisory authority. Further, there will be benefits to smaller businesses. For instance, the Data Protection Regulation will exempt businesses smaller than a certain threshold from the obligation to appoint a data protection officer if data processing is not a part of their core business activity. On top of that, businesses will not have to notify every supervisory authority about each instance of collection and processing, and will have the ability to charge consumers fees for certain requests to access data. These changes will allow businesses, especially smaller ones, to save considerable money and human capital. Finally, smaller entities won’t have to carry out an impact assessment before engaging in processing unless there is a specific risk. These rules are designed to increase flexibility on the margin. If this were all the rules were about, then they would be a boon to the major American tech companies that have expressed concern about the DSM. These companies would be able to deal with EU citizens under one set of rules and consumers would be able to take advantage of the many benefits of free flowing information in the digital economy. Unfortunately, the substance of the Data Protection Regulation isn’t limited simply to preempting 28 bad privacy rules with an economically sensible standard for Internet companies that rely on data collection and targeted advertising for their business model. Instead, the Data Protection Regulation would set up new rules that will impose significant costs on the Internet ecosphere. Privacy rights need to be balanced with not only economic efficiency, but also with the right to free expression that most European countries hold (though not necessarily with a robust First Amendment like that in the United States). Stories about the right to be forgotten conflicting with the ability of journalists to report on issues of public concern make clear that there is a potential problem there. The Data Protection Regulation does attempt to balance the right to be forgotten with the right to report, but it’s not likely that a similar rule would survive First Amendment scrutiny in the United States. American companies accustomed to such protections will need to be wary operating under the EU’s standard. Similarly, mandating rules on data minimization and data portability may sound like good design ideas in light of data security and privacy concerns, but there are real costs to consumers and innovation in forcing companies to adopt particular business models. The story [of data analytics] follows a similar pattern in every field… The leaders are qualitative experts in their field. Then a statistical researcher who doesn’t know the details of the field comes in and, using modern data analysis, adds tremendous insight and value. And mandated data portability is an overbroad per se remedy for possible exclusionary conduct that could also benefit consumers greatly. The rule will apply to businesses regardless of market power, meaning that it will also impair small companies with no ability to actually hurt consumers by restricting their ability to take data elsewhere. Aside from this, multi-homing is ubiquitous in the Internet economy, anyway. This appears to be another remedy in search of a problem. The bad news is that these rules will likely deter innovation and reduce consumer welfare for EU citizens. Finally, the Data Protection Regulation suffers from an ugly defect: it may actually be ratifying a form of protectionism into the rules. Both the intent and likely effect of the rules appears to be to “level the playing field” by knocking down American Internet companies. For months, European government officials and regulators have clashed with the likes of Google, Amazon.com and Facebook over everything from taxes to privacy…. “American companies come from outside and act as if it was a lawless environment to which they are coming,” [Commissioner Reding] told the Journal. “There are conflicts not only about competition rules but also simply about obeying the rules.” In many past tussles with European officialdom, American executives have countered that they bring innovation, and follow all local laws and regulations… A recent EU report found that European citizens’ personal data, sent to the U.S. under Safe Harbor, may be processed by U.S. authorities in a way incompatible with the grounds on which they were originally collected in the EU. Europeans allege this harms European tech companies, which must play by stricter rules about what they can do with citizens’ data for advertising, targeting products and searches. Ms. Reding said Safe Harbor offered a “unilateral advantage” to American companies. Speaking at an event in London, [EU Antitrust Chief] Ms. Vestager said it would be “tricky” to design EU regulation targeting the various large Internet firms like Facebook, Amazon.com Inc. and eBay Inc. because it was hard to establish what they had in common besides “facilitating something”… New EU regulation aimed at reining in large Internet companies would take years to create and would then address historic rather than future problems, Ms. Vestager said. “We need to think about what it is we want to achieve that can’t be achieved by enforcing competition law,” Ms. Vestager said. Moreover, of the 15 largest Internet companies, 11 are American and 4 are Chinese. None is European. So any rules applying to the Internet ecosphere are inevitably going to disproportionately affect these important, US companies most of all. But if Europe wants to compete more effectively, it should foster a regulatory regime friendly to Internet business, rather than extend inefficient privacy rules to American companies under the guise of free trade. Blo ndie: [watching the soldiers fighting on the bridge] I have a feeling it’s really gonna be a good, long battle. Tuco: Blondie, the money’s on the other side of the river. Tuco: Amigo, I said on the other side, and that’s enough. But while the Confederates are there we can’t get across. Blondie: What would happen if somebody were to blow up that bridge? The EU’s DSM proposals are going to be a good, long battle. But key players in the EU recognize that the tech money — along with the services and ongoing innovation that benefit EU citizens — is really on the other side of the river. If they blow up the bridge of trade between the EU and the US, though, we will all be worse off — but Europeans most of all. Remember when net neutrality wasn’t going to involve rate regulation and it was crazy to say that it would? Or that it wouldn’t lead to regulation of edge providers? Or that it was only about the last mile and not interconnection? Well, if the early petitions and complaints are a preview of more to come, the Open Internet Order may end up having the FCC regulating rates for interconnection and extending the reach of its privacy rules to edge providers. For instance, it is not clear why the FCC could not, through Section 706, mandate “network level” copyright enforcement schemes or the DNS blocking that was at the heart of the Stop Online Piracy Act (SOPA). . . Thus, it would appear that Section 706, as re-interpreted by the FCC, would, under the D.C. Circuit’s Verizon decision, allow the FCC sweeping power to regulate the Internet up to and including (but not beyond) the process of “communications” on end-user devices. This could include not only copyright regulation but everything from cybersecurity to privacy to technical standards. (emphasis added). While the merits of Do Not Track are debatable, it is worth noting that privacy regulation can go too far and actually drastically change the Internet ecosystem. In fact, it is actually a plausible scenario that overregulating data collection online could lead to the greater use of paywalls to access content. This may actually be a greater threat to Internet Openness than anything ISPs have done. And then yesterday, the first complaint under the new Open Internet rule was brought against Time Warner Cable by a small streaming video company called Commercial Network Services. According to several news stories, CNS “plans to file a peering complaint against Time Warner Cable under the Federal Communications Commission’s new network-neutrality rules unless the company strikes a free peering deal ASAP.” In other words, CNS is asking for rate regulation for interconnection . Under the Open Internet Order, the FCC can rule on such complaints, but it can only rule on a case-by-case basis. Either TWC assents to free peering, or the FCC intervenes and sets the rate for them, or the FCC dismisses the complaint altogether and pushes such decisions down the road. This was another predictable development that many critics of the Open Internet Order warned about: there was no way to really avoid rate regulation once the FCC reclassified ISPs. While the FCC could reject this complaint, it is clear that they have the ability to impose de facto rate regulation through case-by-case adjudication. Whether it is rate regulation according to Title II (which the FCC ostensibly didn’t do through forbearance) is beside the point. This will have the same practical economic effects and will be functionally indistinguishable if/when it occurs. I mean, I don’t wanna brag or nothin, but it seems to me that we critics have been right so far. The reclassification of broadband Internet service as Title II has had the (supposedly) unintended consequence of sweeping in far more (both in scope of application and rules) than was supposedly bargained for. Hopefully the FCC rejects the petition and the complaint and reverses this course before it breaks the Internet. The CPI Antitrust Chronicle published Geoffrey Manne’s and my recent paper, The Problems and Perils of Bootstrapping Privacy and Data into an Antitrust Framework as part of a symposium on Big Data in the May 2015 issue. All of the papers are worth reading and pondering, but of course ours is the best ;). In it, we analyze two of the most prominent theories of antitrust harm arising from data collection: privacy as a factor of non-price competition, and price discrimination facilitated by data collection. We also analyze whether data is serving as a barrier to entry and effectively preventing competition. We argue that, in the current marketplace, there are no plausible harms to competition arising from either non-price effects or price discrimination due to data collection online and that there is no data barrier to entry preventing effective competition. The issues of how to regulate privacy issues and what role competition authorities should in that, are only likely to increase in importance as the Internet marketplace continues to grow and evolve. The European Commission and the FTC have been called on by scholars and advocates to take greater consideration of privacy concerns during merger review and encouraged to even bring monopolization claims based upon data dominance. These calls should be rejected unless these theories can satisfy the rigorous economic review of antitrust law. In our humble opinion, they cannot do so at this time. The Horizontal Merger Guidelines have long recognized that anticompetitive effects may “be manifested in non-price terms and conditions that adversely affect customers.” But this notion, while largely unobjectionable in the abstract, still presents significant problems in actual application. First, product quality effects can be extremely difficult to distinguish from price effects. Quality-adjusted price is usually the touchstone by which antitrust regulators assess prices for competitive effects analysis. Disentangling (allegedly) anticompetitive quality effects from simultaneous (neutral or pro-competitive) price effects is an imprecise exercise, at best. For this reason, proving a product-quality case alone is very difficult and requires connecting the degradation of a particular element of product quality to a net gain in advantage for the monopolist. Second, invariably product quality can be measured on more than one dimension. For instance, product quality could include both function and aesthetics: A watch’s quality lies in both its ability to tell time as well as how nice it looks on your wrist. A non-price effects analysis involving product quality across multiple dimensions becomes exceedingly difficult if there is a tradeoff in consumer welfare between the dimensions. Thus, for example, a smaller watch battery may improve its aesthetics, but also reduce its reliability. Any such analysis would necessarily involve a complex and imprecise comparison of the relative magnitudes of harm/benefit to consumers who prefer one type of quality to another. If non-price effects cannot be relied upon to establish competitive injury (as explained above), then what can be the basis for incorporating privacy concerns into antitrust? One argument is that major data collectors (e.g., Google and Facebook) facilitate price discrimination. The argument can be summed up as follows: Price discrimination could be a harm to consumers that antitrust law takes into consideration. Because companies like Google and Facebook are able to collect a great deal of data about their users for analysis, businesses could segment groups based on certain characteristics and offer them different deals. The resulting price discrimination could lead to many consumers paying more than they would in the absence of the data collection. Therefore, the data collection by these major online companies facilitates price discrimination that harms consumer welfare. This argument misses a large part of the story, however. The flip side is that price discrimination could have benefits to those who receive lower prices from the scheme than they would have in the absence of the data collection, a possibility explored by the recent White House Report on Big Data and Differential Pricing. While privacy advocates have focused on the possible negative effects of price discrimination to one subset of consumers, they generally ignore the positive effects of businesses being able to expand output by serving previously underserved consumers. It is inconsistent with basic economic logic to suggest that a business relying on metrics would want to serve only those who can pay more by charging them a lower price, while charging those who cannot afford it a larger one. If anything, price discrimination would likely promote more egalitarian outcomes by allowing companies to offer lower prices to poorer segments of the population—segments that can be identified by data collection and analysis. If this group favored by “personalized pricing” is as big as—or bigger than—the group that pays higher prices, then it is difficult to state that the practice leads to a reduction in consumer welfare, even if this can be divorced from total welfare. Again, the question becomes one of magnitudes that has yet to be considered in detail by privacy advocates. Privacy advocates have thus far failed to make their case. Even in their most plausible forms, the arguments for incorporating privacy and data concerns into antitrust analysis do not survive legal and economic scrutiny. In the absence of strong arguments suggesting likely anticompetitive effects, and in the face of enormous analytical problems (and thus a high risk of error cost), privacy should remain a matter of consumer protection, not of antitrust. On Wednesday, March 18, our fellow law-and-economics-focused brethren at George Mason’s Law and Economics Center will host a very interesting morning briefing on the intersection of privacy, big data, consumer protection, and antitrust. FTC Commissioner Maureen Ohlhausen will keynote and she will be followed by what looks like will be a lively panel discussion. If you are in DC you can join in person, but you can also watch online. More details below. Please join the LEC in person or online for a morning of lively discussion on this topic. FTC Commissioner Maureen K. Ohlhausen will set the stage by discussing her Antitrust Law Journal article, “Competition, Consumer Protection and The Right [Approach] To Privacy“. A panel discussion on big data and antitrust, which includes some of the leading thinkers on the subject, will follow. A full agenda is available click here. A New Kingsbury Commitment: Universal Service through Competition? For those in the DC area interested in telecom regulation, there is another great event opportunity coming up next week. Join TechFreedom on Thursday, December 19, the 100th anniversary of the Kingsbury Commitment, AT&T’s negotiated settlement of antitrust charges brought by the Department of Justice that gave AT&T a legal monopoly in most of the U.S. in exchange for a commitment to provide universal service. The Commitment is hailed by many not just as a milestone in the public interest but as the bedrock of U.S. communications policy. Others see the settlement as the cynical exploitation of lofty rhetoric to establish a tightly regulated monopoly — and the beginning of decades of cozy regulatory capture that stifled competition and strangled innovation. So which was it? More importantly, what can we learn from the seventy year period before the 1984 break-up of AT&T, and the last three decades of efforts to unleash competition? With fewer than a third of Americans relying on traditional telephony and Internet-based competitors increasingly driving competition, what does universal service mean in the digital era? As Congress contemplates overhauling the Communications Act, how can policymakers promote universal service through competition, by promoting innovation and investment? What should a new Kingsbury Commitment look like? Space is limited so RSVP now if you plan to attend in person. A live stream of the event will be available on this page. You can follow the conversation on Twitter on the #Kingsbury100 hashtag. The live stream will begin on this page at noon Eastern. As it begins its hundredth year, the FTC is increasingly becoming the Federal Technology Commission. The agency’s role in regulating data security, privacy, the Internet of Things, high-tech antitrust and patents, among other things, has once again brought to the forefront the question of the agency’s discretion and the sources of the limits on its power.Please join us this Monday, December 16th, for a half-day conference launching the year-long “FTC: Technology & Reform Project,” which will assess both process and substance at the FTC and recommend concrete reforms to help ensure that the FTC continues to make consumers better off. FTC Commissioner Josh Wright will give a keynote luncheon address titled, “The Need for Limits on Agency Discretion and the Case for Section 5 UMC Guidelines.” Project members will discuss the themes raised in our inaugural report and how they might inform some of the most pressing issues of FTC process and substance confronting the FTC, Congress and the courts. The afternoon will conclude with a Fireside Chat with former FTC Chairmen Tim Muris and Bill Kovacic, followed by a cocktail reception. Our conference is a “widely-attended event.” Registration is $75 but free for nonprofit, media and government attendees. Space is limited, so RSVP today! Please join us at the Willard Hotel in Washington, DC on December 16th for a conference launching the year-long project, “FTC: Technology and Reform.” With complex technological issues increasingly on the FTC’s docket, we will consider what it means that the FTC is fast becoming the Federal Technology Commission. The FTC: Technology & Reform Project brings together a unique collection of experts on the law, economics, and technology of competition and consumer protection to consider challenges facing the FTC in general, and especially regarding its regulation of technology. Senator Markey’s Do Not Track Kids Act of 2013 Raises the Question: What’s the Point of COPPA? The Children’s Online Privacy Protection Act (COPPA) continues to be a hot button issue for many online businesses and privacy advocates. On November 14, Senator Markey, along with Senator Kirk and Representatives Barton and Rush introduced the Do Not Track Kids Act of 2013 to amend the statute to include children from 13-15 and add new requirements, like an eraser button. The current COPPA Rule, since the FTC’s recent update went into effect this past summer, requires parental consent before businesses can collect information about children online, including relatively de-identified information like IP addresses and device numbers that allow for targeted advertising. Often, the debate about COPPA is framed in a way that makes it very difficult to discuss as a policy matter. With the stated purpose of “enhanc[ing] parental involvement in children’s online activities in order to protect children’s privacy,” who can really object? While there is recognition that there are substantial costs to COPPA compliance (including foregone innovation and investment in children’s media), it’s generally taken for granted by all that the Rule is necessary to protect children online. But it has never been clear what COPPA is supposed to help us protect our children from. The concern about online behavioral advertising could probably be understood in at least three ways, but each of them is flawed. Creepiness. Some people believe there is something just “creepy” about companies collecting data on consumers, especially when it comes to children and teens. While nearly everyone would agree that surreptitiously collecting data like email addresses or physical addresses without consent is wrong, many would probably prefer to trade data like IP addresses and device numbers for free content (as nearly everyone does every day on the Internet). It is also unclear that COPPA is the answer to this type of problem, even if it could be defined. As Adam Thierer has pointed out, parents are in a much better position than government regulators or even companies to protect their children from privacy practices they don’t like. Exploitation. Another way to understand the concern is that companies are exploiting consumers by making money off their data without consumers getting any value. But this fundamentally ignores the multi-sided market at play here. Users trade information for a free service, whether it be Facebook, Google, or Twitter. These services then monetize that information by creating profiles and selling that to advertisers. Advertisers then place ads based on that information with the hopes of increasing sales. In the end, though, companies make money only when consumers buy their products. Free content funded by such advertising is likely a win-win-win for everyone involved. False Consciousness. A third way to understand the concern over behavioral advertising is that corporations can convince consumers to buy things they don’t need or really want through advertising. Much of this is driven by what Jack Calfee called The Fear of Persuasion: many people don’t understand the beneficial effects of advertising in increasing the information available to consumers and, as a result, misdiagnose the role of advertising. Even accepting this false consciousness theory, the difficulty for COPPA is that no one has ever explained why advertising is a harm to children or teens. If anything, online behavioral advertising is less of a harm to teens and children than adults for one simple reason: Children and teens can’t (usually) buy anything! Kids and teens need their parents’ credit cards in order to buy stuff online. This means that parental involvement is already necessary, and has little need of further empowerment by government regulation. COPPA may have benefits in preserving children’s safety — as Markey once put it — beyond what underlying laws, industry self-regulation and parental involvement can offer. But as we work to update the law, we shouldn’t allow the Rule to be a solution in search of a problem. It is incumbent upon Markey and other supporters of the latest amendment to demonstrate that the amendment will serve to actually protect kids from something they need protecting from. Absent that, the costs very likely outweigh the benefits. Google: Great Deal or Greatest Deal? Critics of Google have argued that users overvalue Google’s services in relation to the data they give away. One breath-taking headline asked Who Would Pay $5,000 to Use Google?, suggesting that Google and its advertisers can make as much as $5,000 off of individuals whose data they track. Scholars, such as Nathan Newman, have used this to argue that Google exploits its users through data extraction. But, the question remains: how good of a deal is Google? My contention is that Google’s value to most consumers far surpasses the value supposedly extracted from them in data. First off, it is unlikely that Google and its advertisers make anywhere close to $5,000 off the average user. Only very high volume online purchasers who consistently click through online ads are likely anywhere close to that valuable. Nonetheless, it is true that Google and its advertisers must be making money, or else Google would be charging users for its services. Can you imagine having to pay anywhere near $14 per search on Google? Or a subscription that costs $450 per user per month like some firms pay for Bloomberg? 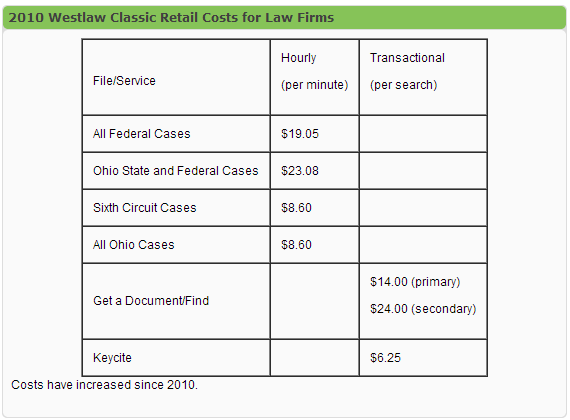 It may be the case that the costs are significantly lower per search for Google than for specialized legal searches (though Google is increasingly used by young lawyers as more cases become available). But, the “price” of viewing a targeted ad is a much lower psychic burden for most people than paying even just a few cents per month for an ad-free experience. For instance, consumers almost always choose free apps over the 99 cent alternative without ads. Maybe the real question about Google is: Great Deal or Greatest Deal? * Otherwise known as unpriced for those that know there’s no such thing as a free lunch. Will the Real Broadband Heroes Please Stand Up? Susan Crawford recently received the OneCommunity Broadband Hero Award for being a “tireless advocate for 21st century high capacity network access.” In her recent debate with Geoffrey Manne and Berin Szoka, she emphasized that there is little competition in broadband or between cable broadband and wireless, asserting that the main players have effectively divided the markets. As a result, she argues (as she did here at 17:29) that broadband and wireless providers “are deciding not to invest in the very expensive infrastructure because they are very happy with the profits they are getting now.” In the debate, Manne countered by pointing to substantial investment and innovation in both the wired and wireless broadband marketplaces, and arguing that this is not something monopolists insulated from competition do. So, who’s right? 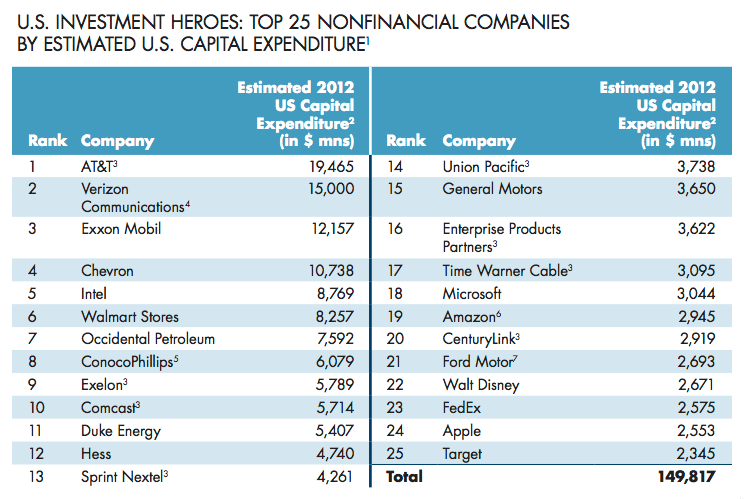 The recently released 2013 Progressive Policy Institute Report, U.S. Investment Heroes of 2013: The Companies Betting on America’s Future, has two useful little tables that lend support to Manne’s counterargument. The first shows the top 25 investors that are nonfinancial companies, and guess who comes in 1st, 2nd, 10th, 13th, and 17th place? None other than AT&T, Verizon Communications, Comcast, Sprint Nextel, and Time Warner, respectively. 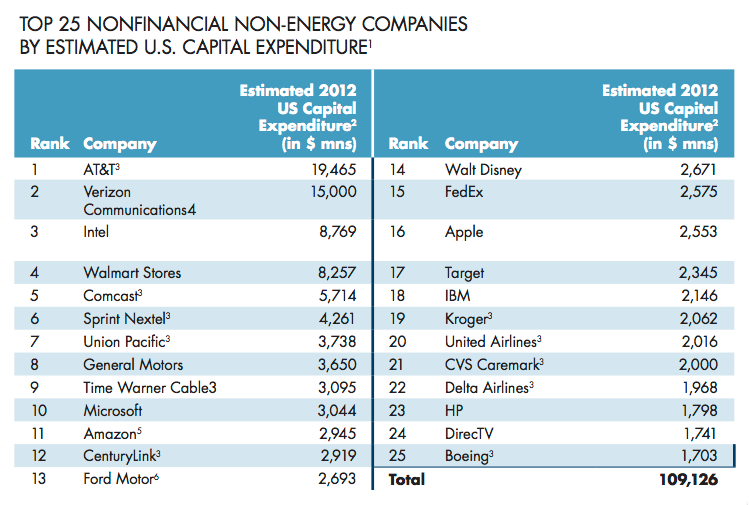 And when the table is adjusted by removing non-energy companies, the ranks become 1st, 2nd, 5th, 6th, and 9th. In fact, cable and telecom combined to invest over $50.5 billion in 2012. This high level of investment by supposed monopolists is not a new development. The Progressive Policy Institute’s 2012 Report, Investment Heroes: Who’s Betting on America’s Future? indicates that the same main players have been investing heavily for years. Since 1996, the cable industry has invested over $200 billion into infrastructure alone. These investments have allowed 99.5% of Americans to have access to broadband – via landline, wireless, or both – as of the end of 2012. This leaves only one question: Will the real broadband heroes please stand up?